Aston Martin previewed its new generation of mid-engine supercars at the Geneva Motor Show with the unveiling of two concept cars. One will be a new supercar that will revive the Vanquish name and fight the Ferrari F8 Tributo, while the AM-RB 003 will be a mid-engine hypercar co-developed with Red Bull Racing that will slot below the Valkyrie. Details were scarce at the time, but a "collector and potential customer" has provided some juicy new technical details to Diariomotor. Aston Martin confirmed at the show that the AM-RB 003 will feature a new turbocharged hybrid V6 engine, but the output wasn’t revealed. According to the Diariomotor, Aston Martin is targetting a combined output of 1,000 hp. This makes it slightly less powerful than the Valkyrie, which has a Cosworth-developed 6.5-liter V12 and an electric motor producing a combined output of 1,160 hp and 663 lb-ft of torque. The AM-RB 003 will also incorporate an eight-speed, "F1-inspired” dual-clutch transmission and a limited-slip differential. 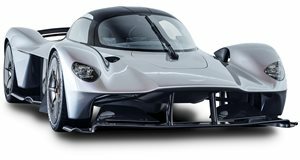 Like the Valkyrie, the AM-RB 003 will feature a full carbon fiber monocoque and carbon body panels that will bring the weight below 2,976 pounds. As a result, the AM-RB 003 will be astonishingly quick. Aston Martin apparently quotes a 0-62 mph time of 2.5 seconds, as well as a top speed of over 220 mph and a power-to-weight ratio of 750 hp per tonne. Diariomotor claims the electric motor will drive the front wheels, meaning the hypercar will be all-wheel drive. It will also have active suspension, platform control, active ride height, and damping systems all derived from the Valkyrie. Production will be limited to just 500 units worldwide, and the hypercar will be sold in both left- and right-hand drive configurations. As for the price, Aston Martin says the AM-RB 003 will start "at no less than £875,000” – that’s an eye-watering $1,152,440. US customers will also need to place a $300,000 deposit to secure one before deliveries for Aston Martin’s mid-engine monster start in 2021.